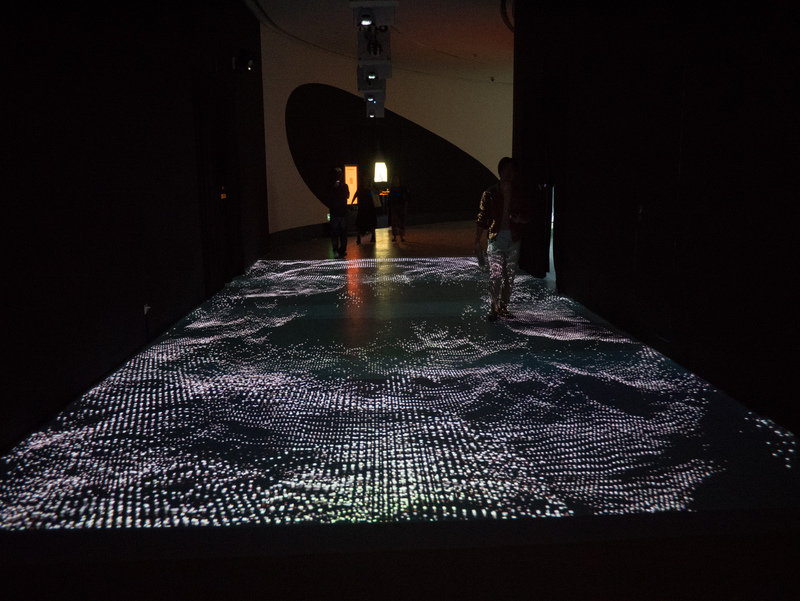 For the inaugural exhibition at the new Powerlong Art Center in Hangzhou, China is an extensive show exploring the future through digital art. The exhibition titled Nine Tomorrows, after the science fiction novel by Isaac Asimov simultaneously references the Chinese classic mythological text, Shan Hai Jing (山海经) where the character Hou Yi (后羿) shoots down nine suns to save the Earth. The exhibition opens up towards a diversity of technological futures through imaginary speculations through science fiction, and aesthetic and scientific experiments through art. 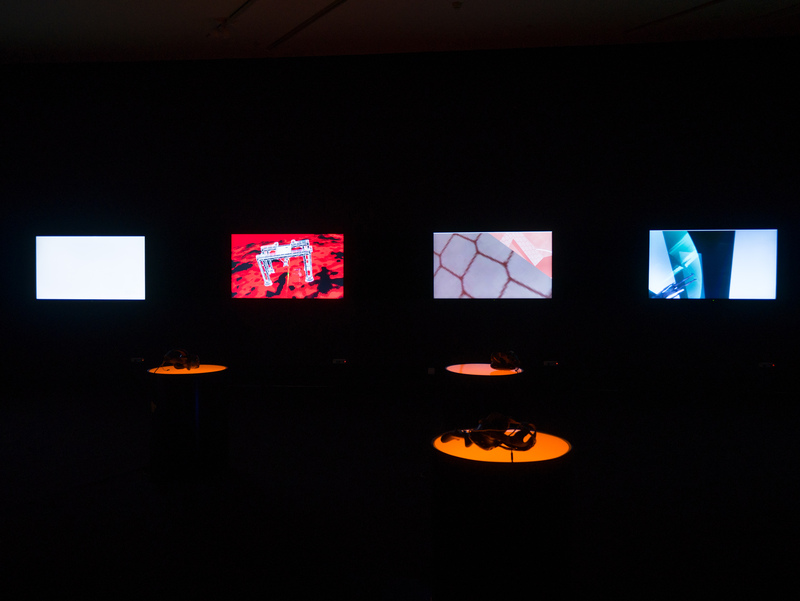 The exhibition is curated by media and sound artist, Yao Dajuin and features works by Asian and international artists working across virtual reality, robotics, animation, motion capture, light installation and kinetic art. The exhibition opened on 4 May with an evening of audiovisual performances in the outdoor space of the museum and is on display until 4 August 2018. Hangzhou is a city situated just outside of Shanghai that is included as part of the rapidly developing Yangtze River Delta Economic Zone. The Powerlong Art Centre is part of a major new development in the centre of the city attached to the Powerlong Mall, which has several locations across China. Surrounded by a luxury hotel, restaurants, shops and a cinema, the art centre is situated on the 5th floor of the complex with an impressive 6,500 square foot two storey museum. The entire ground floor is occupied by the Nine Tomorrows exhibition with winding corridors and several large gallery spaces with elegant curved doorways and modern wood floors –the spaces darkened to create an immersive environment. The upper floor is occupied by several contemporary art displays. As a commercial real estate venture, Powerlong also has an invested interest in art and has incorporated galleries and museums into their malls across the country. The merge of art and commerce is one that more comes naturally in China, as it creates an infrastructure for culture’s support and appreciation within a maturing economy. 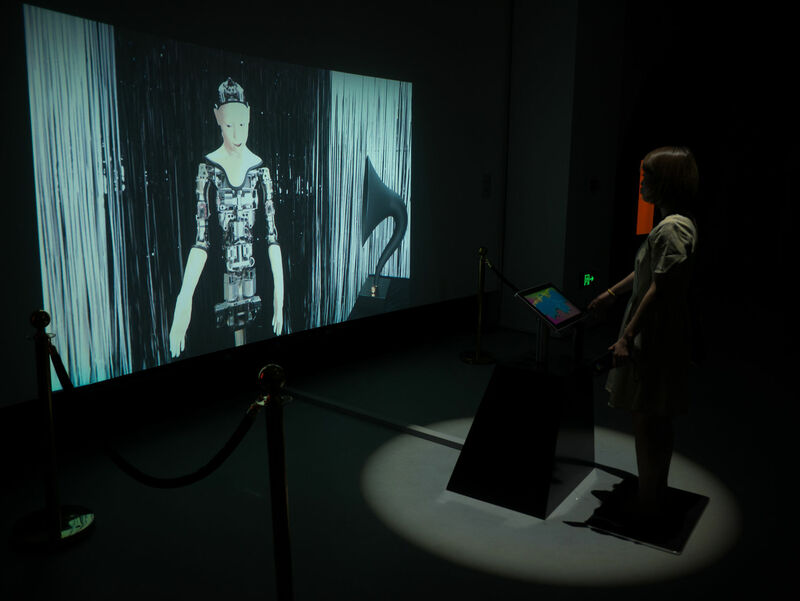 The exhibition features works that brings together diverse practices within digital art including a live streamed robotic interactive piece by Japan-based artists Elena Knox and Katsumi Watanabe (top image). 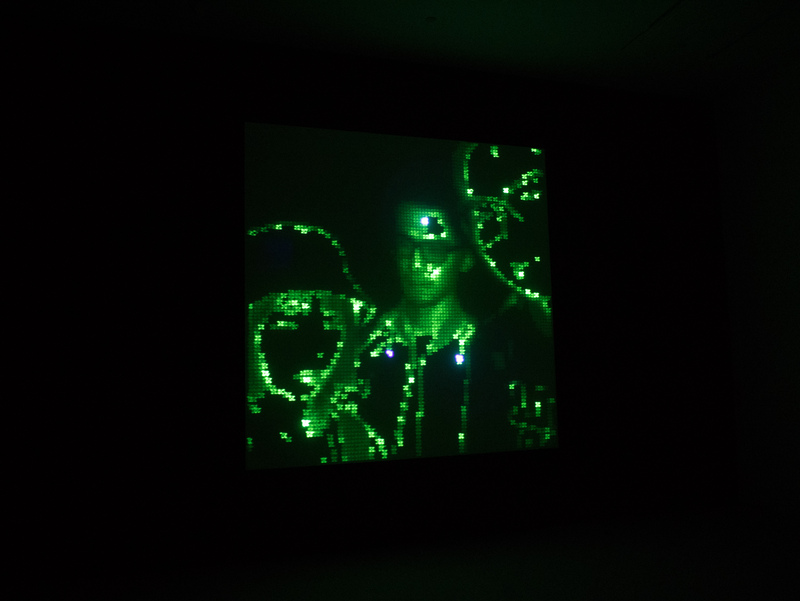 Daito Manabe, Motoi Ishibashi and Yaha Hanai part of the Rhizomatiks Research group, presents a new version of their Fade Out work, which uses a phosphorescent-painted screen and a laser that draws out an image by beaming pixel by pixel onto the screen. The glowing image fades creating a gradient that eventually forms a photorealistic image (above). In another room ten VR headsets with screens displaying science fiction works created by students from the China Academy of Art’s Open Media Lab. 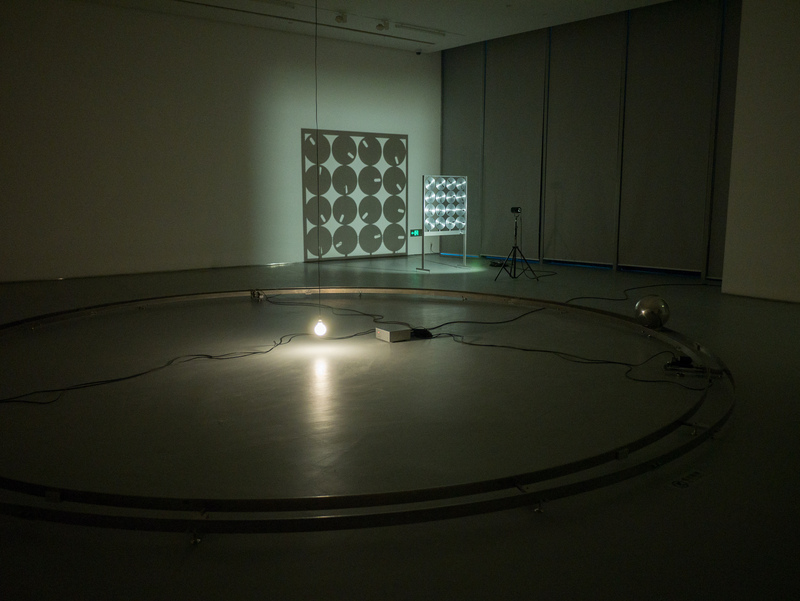 Finnish duo Tommi Grönlund and Petteri Nisunen occupy one room with their minimalist kinetic works with mechanical frames that flex and bend and rolling metallic balls slosh around in a frame creating wave patterns. 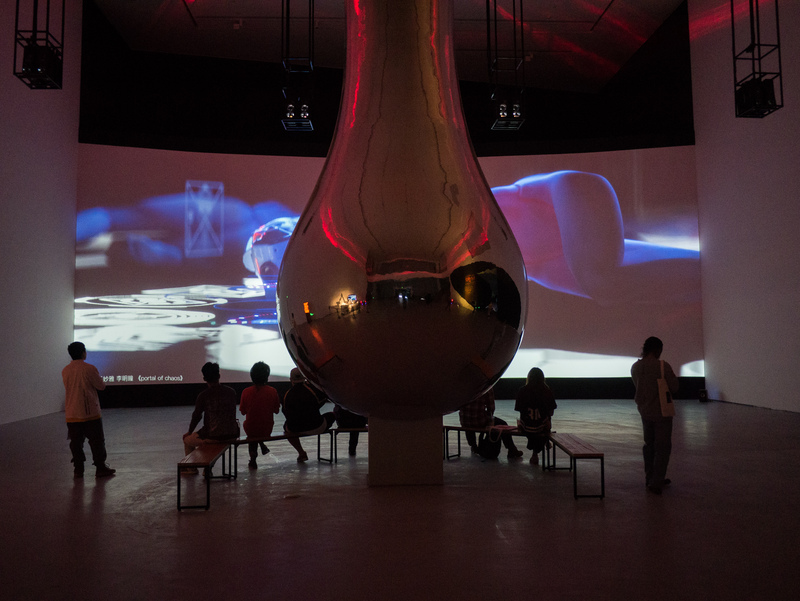 The exhibition includes video and installation works by prominent artists like Victoria Vesna and Lu Yang. A large permanent installation shaped like a reflective drop hangs from the ceiling as you enter the museum. The exhibition explores a diversity of practices and approaches with technology that open up to imaginations towards the future. The opening ceremony kicked off with a high energy motion capture performance by Shanghai artist Lu Yang and dancer Jin Xin in collaboration with Hong Kong based studio MetaObjects. Lu Yang presented her Electromagnetic Brainology Live performance where her 3D avatars of Buddhist deities were animated by a live dancer. 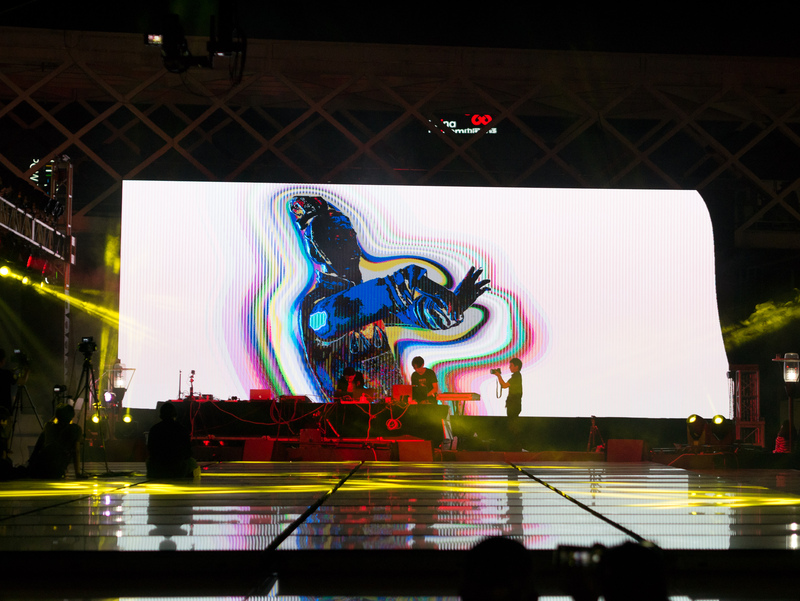 Fast upbeat music bridging techno, breakcore and Japanese pop were accompanied by eye-popping visual effects representing a new hypermediated aesthetic found in contemporary Chinese subcultures. This was followed by live audiovisual performances by Daito Manabe + Satoshi Horii, Yui Miyashita, Kakuya Shiraishi + Scott Allen, Howie Lee and Thoiid, RMBit, Guan Boyang, Alt_Man, Cursed Mac, and NO.E.ZA throughout the night spanning live-coding using TidalCycles, animation and live electronics. Overall the exhibition and performances in Nine Tomorrows presents a pluralistic image of the future in which China now also plays an important role in shaping. The programme seeks to ask what roles artists, academics, scientists and engineers can play in imagining the possible futures of today?